RSVP to jewishartsalon@gmail.com Limited seating. When: Monday November 25. 6 PM - Light buffet dinner & vodka. 6:30 PM - Film. 7:30 PM - Meet the producers. Or send check to Jewish Art Salon, 1324 Lexington Ave #120, NY NY 10128. Go South on CHRYSTIE ST towards HESTER ST.
J, Z, M trains to Essex Street (intersection with Delancey). 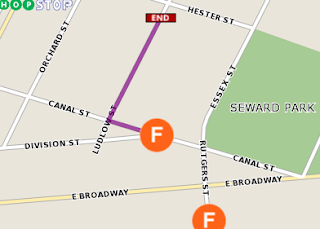 Go South on ESSEX ST towards DELANCEY ST.
M9 to Essex / Canal St.
M15 to Pike St / Division St. Thanks to The National Center for Jewish Film.